If you have sensitive skin, you need a product that provides gentle, long-lasting coverage. Colorescience face powder for sensitive skin is made of organic ingredients that can nurture your skin while giving it a healthy and radiant glow. Do cosmetics irritate sensitive skin? It depends. There is a wide variety of skin conditions that come into play when it comes to sensitive skin. Allergies, diet, and genetic predisposition are just a few of the reasons your skin might be delicate. This can make buying the right cosmetics seem impossible. The ingredients in your makeup might be aggravating your skin. There’s an array of chemicals that can irritate skin, from talc to petroleum. 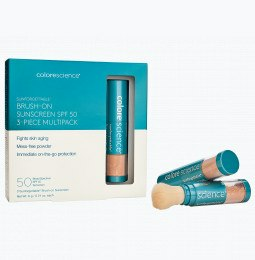 Choose organic makeup from Colorescience as your skin-friendly alternative. A healthy face makeup powder from Colorescience can provide full coverage without compromising your delicate complexion. Our organic brush-on face powder comes in an easy-to-carry tube you can fit neatly in your bag, so you can touch up throughout the day. Does mineral makeup help sensitive skin? can smooth pores, fill in fine lines, and create a smooth finish without looking thick or greasy. Mineral powders contain less filler ingredients, which means you get fuller coverage without over applying and clogging your pores. Try our variety of cosmetics for sensitive skin. 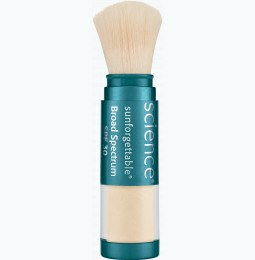 Start by applying a mineral facial primer to create a base for your foundation. Choose our face powder sunscreen with SPF 20 to help defend your sensitive skin from the sun’s harmful UV rays. 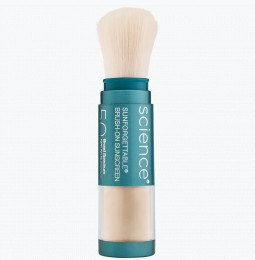 You can wear our powder sunscreen by itself or with our other makeup products to protect your skin all day. Whatever your skin type, Colorescience offers a products that will work for you. Do you struggle with oily skin? Our oily skin face powder will cut down on shine without drying out your pores. If you suffer from dry skin, our makeup powder for dry skin can help you maintain moisture while providing coverage dry patches. Choose Colorescience as your go-to for skin-friendly face powders that make your skin glow.